Why do we use do-while loop in C? Also, tell any properties which you know? When the body of the loop is to be executed at least once. For example, while writing a menu-driven program, where the menu is to be shown at least once. When the loop is to be Exit-Controlled. For Entry-controlled loop, for and while loops are preferred. The do-while loop is post tested or exit tested. 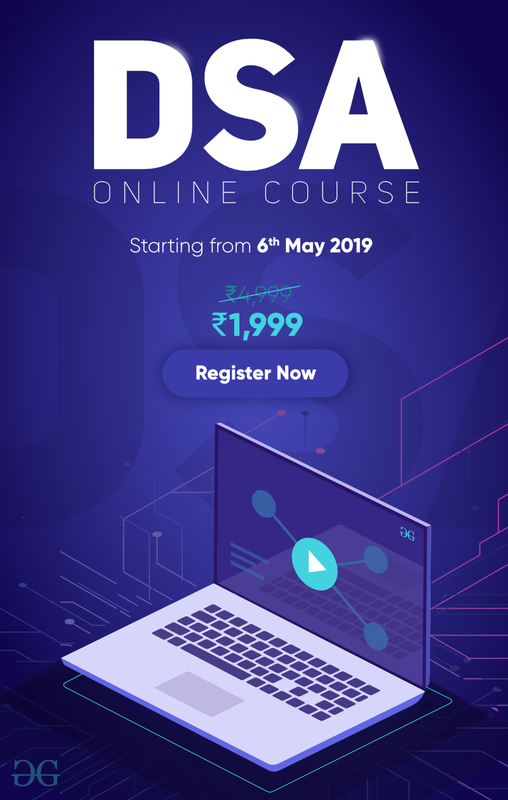 The body of the do-while loop is executed atleast once. The condition checking is done at the end of the execution of the loop body. What is the meaning of break and continue keyword in C? Explain. Break: Break keyword is a jump statement which is used to terminate the loop or switch-case. As soon as the break keyword is encountered from within a loop or switch-case, the execution stops there and control returns from that point immediately to the first statement after the loop or switch. Continue: Continue is also a jump statement just like the break keyword. Continue keyword is opposite to that of break keyword. Instead of terminating the loop, it forces to execute the next iteration of the loop. When the continue statement is executed in the loop, the code inside the loop following the continue statement will be skipped and next iteration of the loop will begin. Define the concept of Modular programming approach? 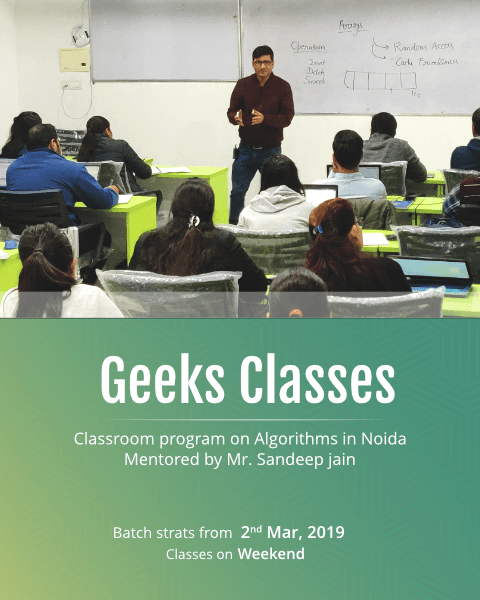 Some programs might have thousands or millions of lines and to manage such programs it becomes quite difficult as there might be too many of syntax errors or logical errors present in the program, so to manage such type of programs concept of modular programming approached. Each sub-module contains something necessary to execute only one aspect of the desired functionality. Modular programming emphasis on breaking of large programs into small problems to increase the maintainability, readability of the code and to make the program handy to make any changes in future or to correct the errors. Explain the difference between function definition and function declaration. Therefore declaration gives details about the properties of a function. In this the function declaration has a semi-colon ‘;’ at the end. Function Definition: Definition of a function is the segment where the body of the function is defined. The body of the function includes the details about the operations performed in this function. After the operations, it also includes the return statement, if any. 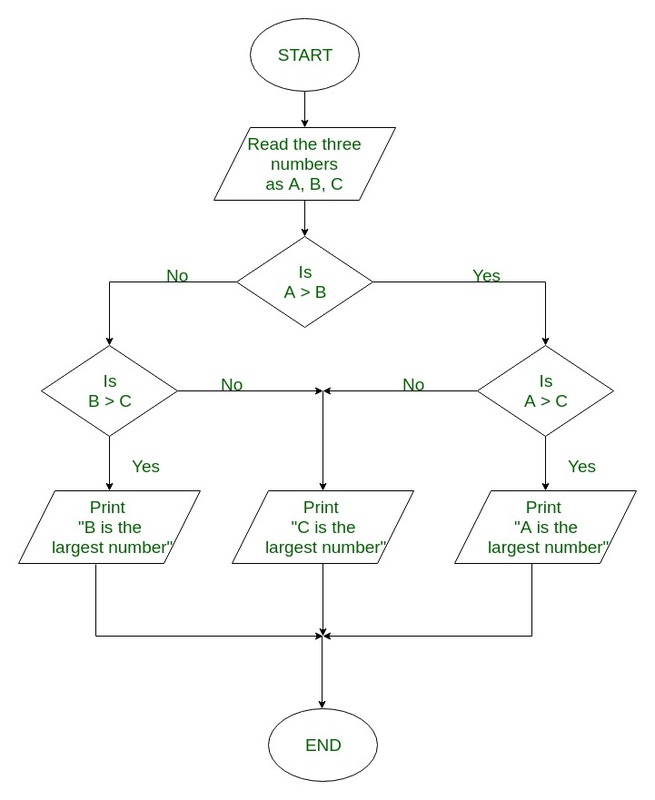 Design a FlowChart and Algorithm to find the greatest number among three numbers. 2. Read the three numbers to be compared, as A, B and C.
3. Check if A is greater than B. 3.1 If true, then check if A is greater than C.
3.1.1 If true, print 'A' as the greatest number. 3.1.2 If false, print 'C' as the greatest number. 3.2 If false, then check if B is greater than C.
3.1.1 If true, print 'B' as the greatest number. What is operator? Also define atleast three operators with example. Operators are the foundation of any programming language. We can define operators as symbols that help us to perform specific mathematical and logical computations on operands. In other words, we can say that an operator operates the operands. Here, ‘+’ is the operator known as addition operator and ‘a’ and ‘b’ are operands. The addition operator tells the compiler to add both of the operands ‘a’ and ‘b’. Relational Operators: Relational operators are used for comparison of the values of two operands. For example: checking if one operand is equal to the other operand or not, an operand is greater than the other operand or not etc. Some of the relational operators are (==, >=, <= ). What will be the output of the below program? Explanation: As value of a = 300 which is not (>= 400), therefore the if condition yields a false and the statement ‘b = 300;’ gets skipped. As a result, the value left in b is just a ‘garbage value’. But the statement ‘c = 200;’ is outside the loop. Therefore it gets executed no matter what. So the value of ‘c’ becomes ‘200’. Hence the output is ‘a_garbage_value 200’. Write a function to interchange the two values of two variables without using a third variable. When we use include directive, the contents of included header file (after preprocessing) are copied to the current file. Angular brackets < and > instruct the preprocessor to look in the standard folder where all header files are held. Double quotes “ and “ instruct the preprocessor to look into the current folder (current directory).